One of the principal aims of the Catenian Association is to advance the interests of young people. 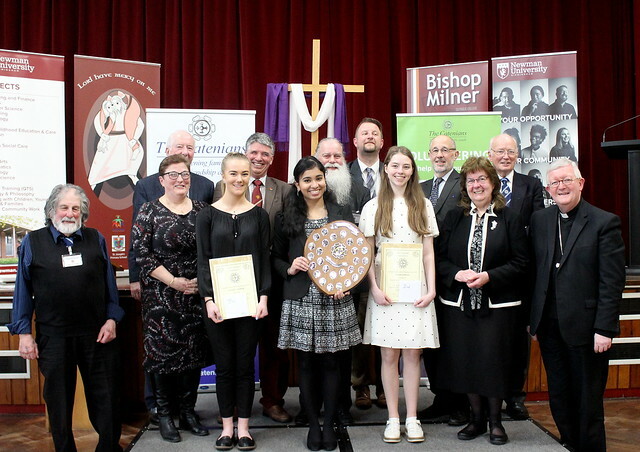 Every year regional heats are arranged by local Catenians for students in Catholic Education to participate in public speaking competitions, to find the contestants for the Catenian Association's National Public Speaking Contest - taking place in Manchester later this year. In our modern world it is essential that young people equip themselves with the skills to communicate clearly and effectively. To this end, and organised this year by the Stourbridge Circle of the Association; Catenians, together with teachers, family and friends of competitors from 10 Catholic secondary schools, amassed at Bishop Milner Catholic College, Dudley, on Sunday afternoon (7th April) for the Midland area competition. His Grace, Archbishop Bernard Longley, is the Patron of the competition and joined the judging panel with chief adjudicator David Handy, Senior Student Recruitment Manager from Newman University, and Angela Clancy, an experienced teacher. Following the presentation of their chosen topics the students, aged between 16 and 18, waited for the panel of judges to make their adjudication, during which the audience were entertained by Andrew Temba, a talented pianist and student at Bishop Milner College. Before announcing the prizes, Mr Handy commented on the quality of the speeches and gave some advice on how to improve on the already high standard achieved - particularly the choice of topic, which he suggested should be one where you have a passion and knowledge about as this will show in the quality of the presentation. Archbishop Longley then presented all competitors with a certificate and £20 gift voucher and the top three places were announced. Third place was won by Natalie Andrews from Bishop Walsh Catholic School, Sutton Coldfield; second place to Niamh Gibbons of Bishop Milner Catholic College - who both received certificates and gift vouchers for £50 and £75 respectively. The overall winner of the competition was Linto Tom, from St Augustine’s Catholic High School, Redditch, who received a certificate and a voucher for £100, and the Catenian Association Shield and £100 for her school. The main organiser for the competition, Catenian Peter Harrington, said: "We offer a big ‘thank you’ to the teachers who give so much of their time working with the students and all those who have supported them in their endeavours. "We hope that all who have taken part today will draw positives from the experience and we wish them well, both for today, and more especially in their future chosen careers."